Children in day care situations are learning throughout the day, simply by playing games, reading, doing crafts, working puzzles, and participating in other activities that the teachers have selected for their lesson plans. Educational opportunities go far beyond the organised ones however, so day nursery teachers are wise to look for and utilise everyday situations and activities to teach children. While interacting with children throughout the day, day care workers have many opportunities to teach and reinforce children’s learning. One of the easiest and moist effective ways of introducing information to children is simply by choosing the most descriptive words possible when conversing with kids. Offering detailed descriptions of people, animals, places, feelings, sensations, and things not only increases children’s vocabularies, but increases their observational skills, as well. Using words that clarify something’s size, colour, texture, weight, or age can help kids to increase their base of knowledge. Once they’ve learned to count (and even as they are learning), kids have a natural curiosity about matters of size and quantity. There are a number of ways that interested adults can help kids to understand quantities and measurements, most of which can be incorporated into existing games and activities. 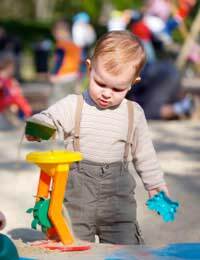 Owners of day nurseries may want to purchase sand and water tables for the children, allowing them to measure and compare quantities of both in assorted sized containers, activities that are both fun and educational. Children can also be asked to compare opposites, like tall and short, light and heavy, noisy and quiet, dark and light, etc. so that they understand the varying qualities of things. Most children (and adults, too!) enjoy music, so when “lessons” are put into song form, they are easily learned and absorbed. Most of us can recall internalising some material because our teachers presented the information in songs or rhymes, making them memorable. Counting songs, songs and dances that point out the names of body parts, and those that help kids to remember the order of things are all good examples of using music for educational purposes. Teaching children, especially the youngest ones, is often as simple as talking to and playing with them. Kids are always learning, so caregivers are feeding their growing minds every time that they are snuggled up reading, creating crafts, putting puzzles together, or simply chatting while they share a snack. Making the most of the time that children spend in day care is important because kids learn so much about the world around them in those first years, so the people who are responsible for their development should take pride in surrounding kids with kindness and meaningful experiences.